Tooth pain can be present for any number of reasons. A patient may have had an injury or accident, tooth decay could be compromising the tooth, or an infection could be the issue. A cracked tooth or exposed nerve causes tooth pain, as well. Regardless of the cause, pain or a toothache makes it difficult to sleep, eat, and get on with your daily routine. If you experience pain in your mouth or tooth, give your Novato dentist a call as soon as possible. The longer you avoid treatment, the more severe the pain, infection, or decay can become. A common cause of tooth pain is damage to the root canal. So, here is an ‘at a glance’ look at root canal therapy. Our Novato dentist determines if you need a root canal through X-rays and a dental examination. 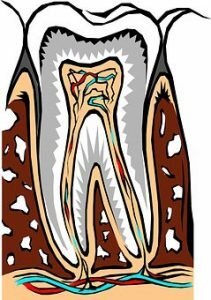 If decay is present and affecting the root of the tooth, a root canal may be recommended. This procedure is much like having a cavity filled. The doctor removes the decay and prepares the area, after first numbing the area so you have a pain-free experience. Once the decay has been removed and the root sterilized, the area is sealed off. This way, bacteria, new decay, and food can’t make their way into the root. If an infection has made its way into the area, we may temporarily cap the tooth with a crown until antibiotics can heal the infection. Should no infection be detected, we can often place a permanent crown. The crown is essential for strengthening the tooth, though each case is unique. To best understand how your situation will be handled, feel free to schedule a consultation. A visit with our Novato dentist is the best way to know if a root canal is necessary to restore your tooth. The level of pain one experiences from a compromised tooth often varies. Some patients experience very little pain, yet the root is severely damaged, while others report extreme sensitivity. The most important point to remember is that if decay is present, it will continue to spread leading to additional restorative dentistry needs. Pay attention to the signs your mouth and body are signaling to you and seek guidance from our Novato dentist when you have an aching tooth. We provide a variety of services intended to improve your dental health and keep your smile looking beautiful. Learn more about these services online or call our office with your questions.